Before I get into my specific thoughts of the Kettler Ergo Racer, I figure I should explain my road that led purchasing it. First of all, I am not a fan of indoor riding or trainers. I have a pair of rollers and a magnetic trainer. Both are mild forms of torture to me, the trainer especially so. A couple of years ago though I was preparing for Ironman Arizona and would jump in a spin class when the weather was too cold. I didn’t really follow the instructor with all the activities, but enjoyed the spin bike because the heavy flywheel gave a more realistic ride, it was sturdy enough that I could really attack hills out of the saddle and it was much quieter than my trainer or rollers. The fitness center also had a couple of stationary bikes that had a 3d graphic of the course you were riding complete with other riders and your previous best effort. Great application but the bike is very upright and not anything close to my riding position. With these two thoughts in my head I started looking for some kind of spin bike that had the ability to control the resistance and have a graphical interface. 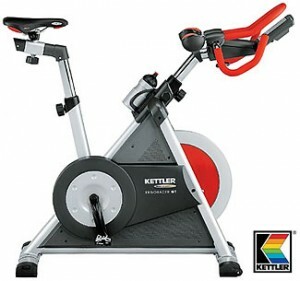 Well, long story short, the search took forever, but I found the Kettler Ergo Racer and pulled the trigger. The bike itself is very sturdy, just like the spin bikes and it has a 40 pound flywheel, so the ride feels very realistic. Although it looks a little strange in the picture, the Kettler design allows you to set it up just like your actual bike, aerobars and all. 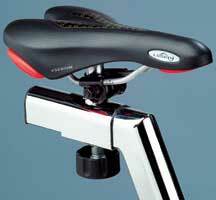 This was a concern of mine before I bought it as I wanted to be positioned just like I am on my triathlon bike. The only difference I noticed is that the aerobars are wider that what I have on my bike. Very minor and to me a non issue. The saddle is a standard saddle which I found comfortable, but if you prefer something else like Adamo, it’s an easy switch. It comes with pedals, but I never took them out of the package, opting instead for my Look Keo’s. The Handlebars are made of a heavy duty metal (same size as your bike handlebars, just much sturdier) and can be changed from a road setup to triathlon bull-horn, or upside-down for a cruiser position. I found the bull-horn setup to be too deep, but am very happy in the road set up. 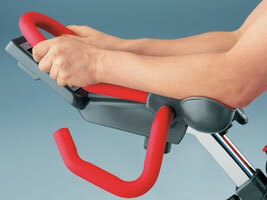 The resistance is controlled magnetically and unlike a spin bike has a freewheel, so you can coast. It’s also whisper quiet. No need to apologize to the neighbors about the noise or even turn up the TV, the only noise you will hear is a quiet hum. Very nice for someone who has two small children that I don’t want to wake. 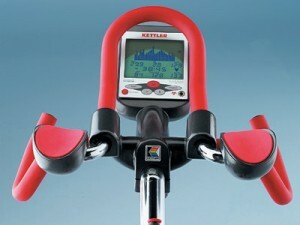 The Kettler Ergo Racer comes with a computer console in which you can ride some preprogrammed workouts or do your own thing in the manual setting. For a quick workout, I think they work just fine. The console also shows your heart rate (it will pick up your Polar signal) speed, cadence, time, watts, distance, and calories burned. I will say that the speed/distance isn’t all that accurate, but that wasn’t a big issue for me as I had a fix for it. The only piece of this puzzle that was missing was the 3d simulation of the course you are riding. I really wanted this as it held my attention better than anything else I have tried. In my research I found that there is a product made by Fitcentric called Netathlon2. It allows you to ride courses (some famous) against yourself or others online and will work with dozens of bikes/trainers (I will review this soon). Underneath the console of the Kettler is a port that will allow you to hook into a computer. I got Netathlon2, plugged it into my Kettler and I am riding the Ironman Hawaii Course in 3D. Perfect! Overall I am very pleased with my purchase. If I were going to complain about anything it would be the console and native technology that seems to be a bit outdated. If Kettler wanted to hit a home run they would stick a better chip, screen and software in the console to give more options out of the box. As I mentioned though, I rarely use the console as I bypass it by plugging it into my computer so as to get all the bells and whistles. Occasionally the handlebars loosen a little, but not had a problem with the seat post. If memory serves (I’m not in front of it right now) the seat post had a peg and hole system that you tightened a well. Make sure that the peg or bolt is going in the hole and not inbetween holes. Considering the ergorace, but wonders about the power accuracy? With a turbo trainer it drifts severly the warmer it gets. Have you noticed anything with the ergorace? No. I use the power through my laptop connected to it (netathlon) and never seen a drift. A trainer has that friction from the tire and this has almost no friction. raining on the ergoracer generates vibrations as from 180 Watt onwards with a speed as from 35 km/h. vibrations are realy cumbersome. Has anybody experienced the same problem ?